Western Balkans: Another EU Expansion? The EU-Western Balkans summit held in Sofia, Bulgaria, on May 17, 2018, did not result in anything unexpected. The summit was organized by the current EU chair, Bulgaria, which prioritizes relations with the neighboring region. The last EU-Balkans summit took place in Thessaloniki 15 years ago, when Greece headed the Council of the European Union. Greece also borders on the Western Balkans and has a stake in the region’s stable development. The main reason the full-format meetings are so few and far between is that the EU countries differ in their positions on Kosovo. It is common knowledge that Greece, Romania, Slovakia, Spain and Cyprus do not recognize Pristina’s independence. The latest summit was also prepared amid discussions and uncertainty as to whether it would be attended by the heads of all the EU states, who had arrived in Sofia primarily for the EU summit. For example, Spanish Prime Minister Mariano Rajoy, at the last minute, authorized the Spanish EU Ambassador to attend the official part of the EU-Western Balkans Summit in his place. As expected, the summit’s final declaration did not directly mention the accession of six Balkan states to the EU. The EU Strategy published in February 2018 only says that Serbia and Montenegro alone are “potentially ready” to join the EU in 2025. At this point, accession negotiations have only been opened with these two countries. Albania and Macedonia have been on the list of candidates since 2014 and 2005, respectively. Bosnia and Herzegovina and Kosovo cannot even hope for this offer, being both economically weak and facing serious political problems. The main reason the EU heads of state came to Bulgaria’s capital on May 17 was the EU’s own summit. The top-level meeting was held amid growing complications in relations with the United States, something that determined both its agenda and general atmosphere. A number of unilateral economic and foreign policy steps taken by Donald Trump (higher steel and aluminum tariffs, withdrawal from the Iran nuclear deal, relocation of the US embassy to Jerusalem) call into question not only the future of the trans-Atlantic partnership but also in general the cooperation between the two “power centers” amid an uncertainty not seen since the 1970s. 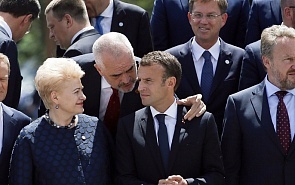 Nevertheless, despite the historically heterogeneous relations between the EU member-states and the US, the EU summit demonstrated unanimity in their commitment to inner cohesion and Eurocentrism. The EU heads of state empowered the European Commission to protect the interests of Iran-based European companies and confirmed their loyalty to the existing nuclear deal. Jean-Claude Juncker has equally clearly outlined the condition for further talks on the Trans-Atlantic Trade and Investment Partnership: the US should renounce its plans to introduce customs barriers against EU steel and aluminum on June 1, 2018. The EU’s main concern today is whether it can trust the current US administration. Disrupting the long-standing model of relations on both sides of the Atlantic may strongly affect European stability in general. The international picture as a whole will depend on how independently the EU can play and on how far Donald Trump will go in his foreign policy. COMMUNICATION FROM THE COMMISSION TO THE EUROPEAN PARLIAMENT, THE COUNCIL, THE EUROPEAN ECONOMIC AND SOCIAL COMMITTEE AND THE COMMITTEE OF THE REGIONS A Credible Enlargement Perspective For And Enhanced EU Engagement With The Western Balkans, Strasbourg, 6.2.2018 COM(2018) 65 final. URL: https://ec.europa.eu/commission/sites/beta-political/files/communication-credible-enlargement-perspe... (Accessed 21.05.2018). EU-Western Balkans Summit, Thessaloniki Declaration, 21 June 2003. URL: http://europa.eu/rapid/press-release_PRES-03-163_en.htm (Accessed 21.05.2018). Энтина Е.Г. Международный контекст евроинтеграции Западных Балкан: монография / Е.Г. Энтина. – М. : Ин-т Европы РАН , 2016. –130с. EU leaders take joint position on Iran deal, US trade //EURACTIVE.com, 18.05.2018. URL: https://www.euractiv.com/section/global-europe/news/eu-leaders-take-joint-position-on-iran-deal-us-t... (Accessed 21.05.2018).